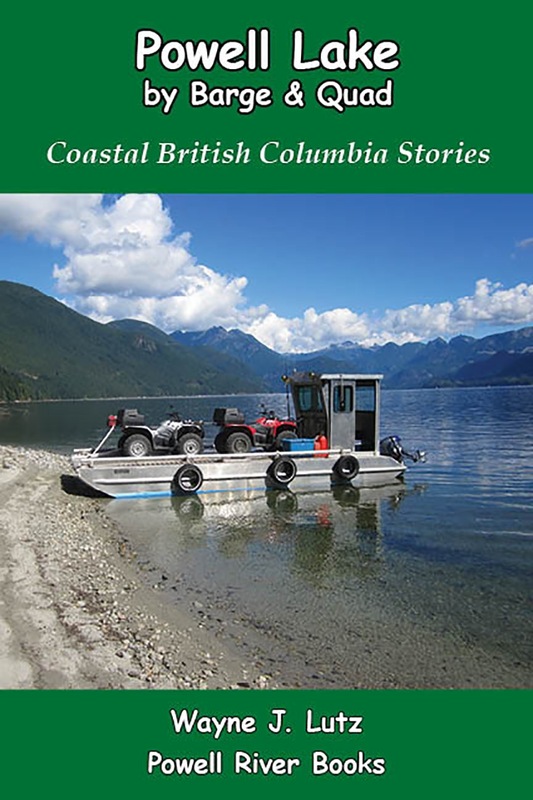 To reach Goat Island, you need a boat, landing craft, or barge. There are two Western Forest Products docks and barge ramps available. It's best to contact WFP for information about active logging and road building prior to riding. The newer of the two landings is the Dunn Dock on the south side of Goat Island. 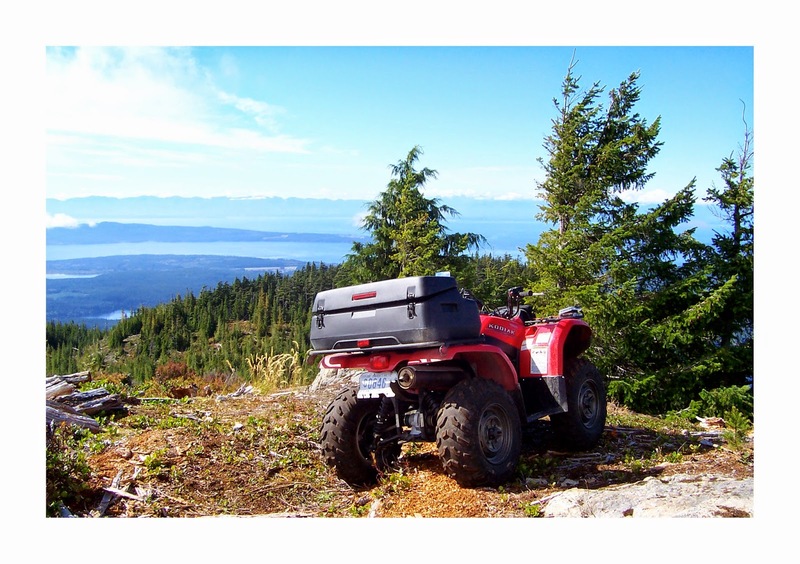 We chose to ride there on the BC long weekend, so there wasn't any road building or forestry work going on. The barge ramp, dock, and roads were all available for recreational use. From the Dunn Dock you look east up Powell Lake towards the high country and the entrance to Goat River and Goat Lake. The first afternoon we rode from the barge ramp up Dunn Main. First we explored some of the new logging roads along the southern shore. Equipment was parked in place, ready to continue work after the holiday. The new roads are wide, ready for the "fat trucks" to haul logs from the cut blocks down to the log dump. The old roads are narrower, but in good condition. There has been extensive logging on Goat Island over the years. The slashes are in different stages of regrowth. And there are still some one hundred plus year old trees along the way. We returned to the barge to camp for the night. As usual, we were alone. Even on busy holiday weekends, you can find uncrowded locations. We cook on the dock with a single burner butane stove. It packs in its own case and is handy for hot meals after a long ride. Stoves are about $25 and butane fuel costs $3 a canister, which lasts for several meals. I've put together simple food cooking and serving kits that we leave stored in the barge for easy trip preparation. On the second day we took Dunn Main to connect with Frog Pond Main and Clover Main to cross over the island to the main Goat Dock on the west side. This was a very beautiful ride. Several of the old spurs we tried were blocked by blown down trees or rock slides. Unfortunately, we didn't have our trail clearing supplies with us this trip. We went up Spire Lake Main on the second day, but weren't able to find Spire Lake or the two old growth trees we can see on the west ridge of Goat Island from our float cabin in Hole in the Wall. UPDATE: Since this post was written the Dunn Dock was removed and the barge ramp and logging road are no longer maintained. Western Forest Products doesn't plan to reopen this location at this time. 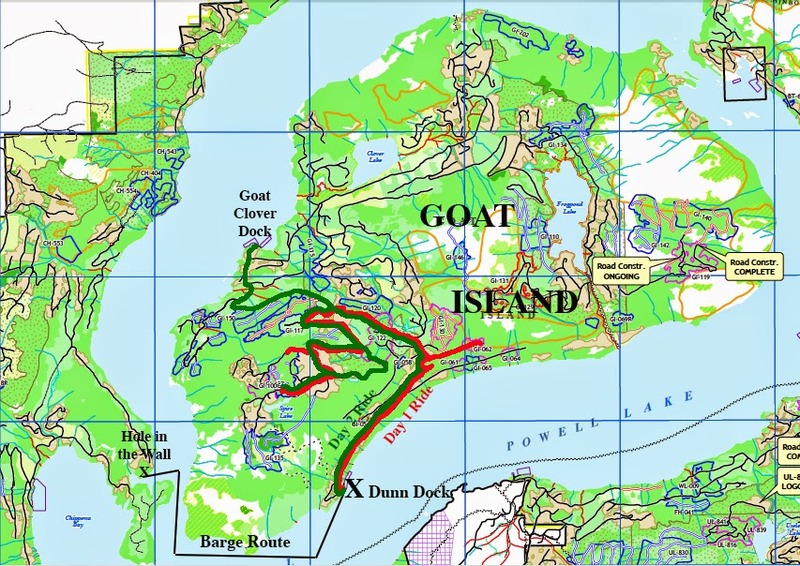 Goat Island logging roads can still be accessed via the Goat Lake (Clover) main dock and barge ramp.